Dr. Walls grew up in the suburbs of Randolph, New Jersey. Upon graduating high school, she began her collegiate career at Fairleigh Dickinson University, where she graduated with an Associate’s Degree in Dental Hygiene. She was awarded the Dean’s Award upon graduating and was determined to further her goal to become a dentist. While working as a dental hygienist, Dr. Walls completed the necessary requirements to successfully gain entrance into the Dental School at Fairleigh Dickinson University. Dr. Walls graduated in 1985, when she was awarded the American Association of Women Dentists Award. Upon receiving perfect scores in every discipline of the Northeast Regional practical board exam, Dr. 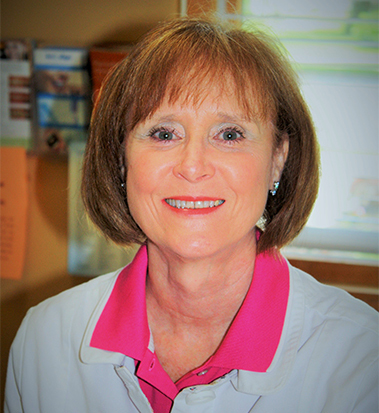 Walls has continued this high standard of excellence in all aspects of patient care throughout her dental career. Dr. Walls began practicing general dentistry with Dr. Vickers after a short time in a general practice in Nanuet, NY. She began on a part-time basis, which allowed her the luxury of being at home when her children were younger and growing with them professionally as they matured. Her main focus of continuing education has been cosmetic and orthodontic dentistry. She includes certificates in Snap-On-Smile, Lumineers, Invisalign I and II, Denstply MTM — a new, cutting edge straightening discipline devoted to the anterior six teeth — and Zoom II whitening procedures in her never-ending quest to offer patients as many alternatives as possible to achieve desired results. She has also utilized the expertise of a trusted laboratory to partner in designing very successful removable orthodontic appliances for those patients where cost of other procedures may seem prohibitive. Dr. Walls has served as a expert dental consultant on multiple studies for Avon Industries. Dr. Walls has been recognized as an Oral Health Champion, in appreciation for supporting the 2014 NYS Mission of Mercy and its objective of providing exceptional dental care to those without access. She, along with Dr. Vickers has,on multiple occasions as recently as 2014, been recognized for honors of distinction and excellence by the National Consumer Board for Dental excellence. Along with Dr. Vickers, she has thoroughly enjoyed building a thriving family practice based on excellence, never ceasing to continue her education both in dentistry and the study of human nature! Dr. Walls is a member of the ADA (American Association of Dentists), the NYS Dental society and the Ninth District Dental Society.